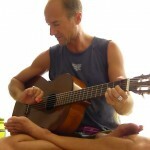 Greenpath Ashtanga Yoga, Authentic yoga teachings in Asia, Europe and USA since 2001, Director, Clayton Horton. This Class offers details and descriptions of the Ashtanga yoga Surya Namascar A. This class presents fundamental technique of the sun salutations and standing poses of Ashtanga yoga. Learn the important details of breath and movement of the Ashtanga "jump back" and "jump through". Beginning as well as more advanced versions are taught in this class. For additional interviews click here. Stay up to date with Clayton's yoga retreats and workshops.